Health Costs > How Much Does Chelation Therapy Cost? How Much Does Chelation Therapy Cost? Chelation therapy, an FDA-approved therapy, involves administering substances to remove heavy metals from the body such as mercury, iron, arsenic and other forms of toxic metal poisoning. Although chelation therapy is specifically used for the purpose of cleansing the body of lead poisoning, it can also be used as an alternative medicine used to treat heart diseases and autism. 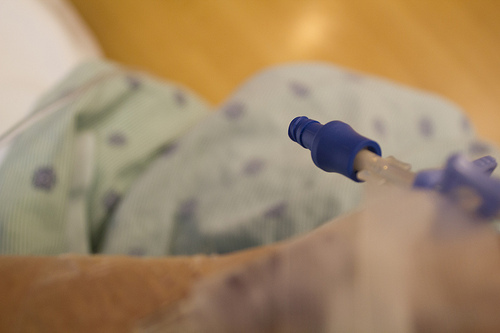 On average, the cost for chelation therapy can be anywhere between $75 and $150 per I.V. treatment, and the total cost for the treatment, depending on the medical condition, can be anywhere from $3,000 to $4,000 total when everything is said and done. According to our research, most medical professionals will first want to assess your health/medical history and take a physical exam. Like a basic doctor office visit, these fees can be in the $125 to $175 range. After this assessment, a lab screening, which will include a basic blood and urine test, will be required to make sure you’re suitable for the procedure. This screening can cost $100 to $200, depending on which lab you use and the number of tests your physician orders Once you’re considered a candidate, each I.V. treatment can cost $75 to $150 each, and most medical professionals will recommend a lab test after every six to eight treatments to check your levels. Harvard University says each treatment can cost $75 to $125, and dozens of three-hour treatments will be necessary over a period of months to see desirable results. All in all, according to Harvard, the costs can exceed $5,000 and won’t usually be covered by health insurance. The New York Times stated it could cost about $5,000 for a course of treatments. Chelation therapy is used to remove any heavy metals from the blood, and the procedure, according to drweil.com, involves intravenous injections using a small needle of a chelating agent, ethylene diamine tetra-acetic acid and synthetic amino acid. The EDTA inside the injection will bind to the minerals and heavy metals inside the bloodstream so it can be excreted in the urine later. Aside from an injection, an oral chelating agent, known as Succimer, is FDA approved and helps treat lead poisoning. This oral agent combines the metals in the bloodstream, and like the I.V., it will be removed by the kidneys and excreted in the urine. Aside from EDTA, some agents may use DMPS, MgEdta or CaEdta. DMPS is commonly used to diagnose the toxicity of heavy metals found inside the body, while MgEdta is a magnesium EDTA. CaEdta is considered to be a calcium EDTA, a common form known to bond to lead. However, according to some recent studies, some practitioners have claimed it can treat atherosclerosis, which is the hardening of the arteries. Since the EDTA can reduce the amount of calcium, it may be able to reopen the arteries clogged with plaque. The average treatment will take three hours, and the average patient will need more than 30 sessions, depending on the status. Most will visit the clinic once or twice per week. DC Nutrition says 12 to 15 treatments one or twice per year is the average number that will show benefits. Some patients, according to the website, may need 100 infusions. During the procedure, you will relax in a recliner where you’re able to read, use the computer or even take a nap. In most cases, it can be done inside the physician’s office or a local clinic. In most cases, the patient will feel very little discomfort. As mentioned above, a lab screening will be necessary after every six to eight procedures. These screenings will test for your toxic metal levels such as mercury and may include a blood, urine, chest x-ray and/or hair sample. If the levels are still deemed to be high still and the treatment needs to continue, then the I.V. treatment will continue. Each lab screening can cost $100 to $200 each. Additional tests outside of the mandatory screenings such as testing for toxic metals or environmental toxins can cost an additional $150 to $275. The most common side effect, according to Andrew Weil, M.D., is a burning sensation at the site of injection. Rare side effects, according to the doctor, may also include nausea, vomiting, headaches and fever. Harvard University says a drop in calcium levels or blood pressure can be seen in some cases. Since there’s a good chance you will need more than one session, many clinics will offer a discount up to 20 percent off if you were to purchase your sessions in bulk. The more sessions you purchase at once, the more you can save. This therapy is considered controversial, and because of this, most health insurance companies won’t cover the procedure.